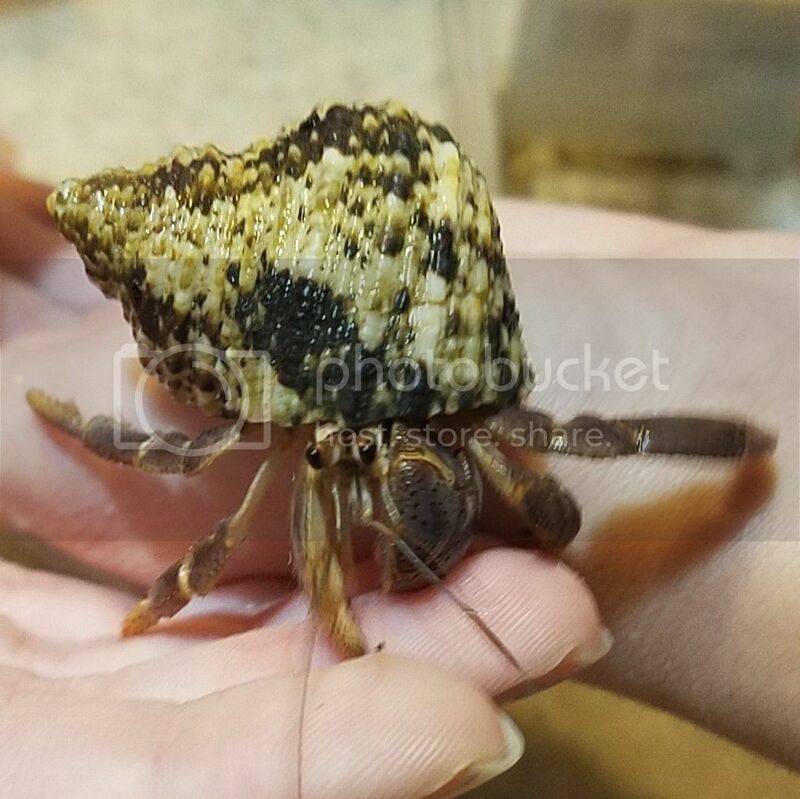 Adopted 2 Crabbies that weren't in best condition; not moving or eating much! Please post here if you are having a crab care emergency! Use a real subject and not just "HELP!" Since you've come to the emergency forum, we know you want a fast answer to your question. In order for us to figure out the problem as quickly as possible, we ask that you answer the following questions as best you can. Some of them may seem odd, but they're all designed to give us the information we need to give you a good solution for your problem. The things in the [ brackets ] are there to make this post easier to read once submitted. Thanks! 2. Do you have gauges in the tank to measure temperature and humidity? If so, where are they located and what temperature and humidity do they usually read? Yes, they are located on side of tank; Humidity is 85% and Temp is 75. 3. Is a heat source used in the tank? If so, what? I have a ZooMed 30-40 gallon size. It is attached to the back of my 10 gallon tank. It takes up most of the back part. 4. What types of water are available (fresh or salt) and how is the water treated (what brands of dechlorinator or salt mix and what ratio is used to mix it)? Both fresh and salt water is available. Both dechlorinated with Tetra AquaSafe Plus. I'm using Instant Ocean for the salt mix. 5. What kinds of food do you feed and how often is it replaced? I'm currently feeding them freeze dried shrimp, cornmeal, spinach, peanut butter, honey, and apple. 6. How long have you had the crab and what species is it, if known? I just adopted them from someone this past weekend so I've only had them a few days. I think at least one is a PP. Maybe both. I think the woman I adopted from said that she had them a year or so. 7. Has your crab molted, and how long ago did it happen? I don't know. 12. How often do you clean the tank and how? I haven't had to clean it yet since I've only had them two days, but I will clean it weekly and whenever needed. 13. Are sponges used in the water dish? If so, how are they cleaned? No sponges. 15. 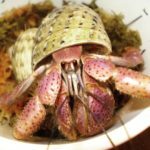 Is there any other information you would like to share that might be helpful (anything that is regularly part of your crab care, playtime, bathing, etc.)? 16. Please describe the emergency situation in detail. I'm just concerned about my crabs' well-being. I just adopted them from someone who was not caring for them in the correct way. They had only an inch of completely dry sand. No heater, no moisture, no lid. They were only being fed cornmeal and sometimes shrimp. I have no idea how cold it was in the home they were living in. I also do not know the quality of their water/food. I'm just nervous because they haven't been eating or moving much since I set up their new home. I don't know if they have to recover or if they are too weak. One was active when I first put them into their new set-up but then hasn't left the coco-hut since last night. The other one has not moved much at all. It is hanging out a little bit from its shell and moves a tiny bit, but that's it. What do you think is going on? Should I be super worried? Do I just need to wait it out and see? Do you think they are still cold? Any advice, help, suggestions, etc. are greatly appreciated! Thanks! Re: Adopted 2 Crabbies that weren't in best condition; not moving or eating much! I'm no where near experienced as most on here. But I would say it sounds like you're doing everything right. You could try raising the heat a bit. To 80. Otherwise just let them chill. Keep in mind, unfortunately, they probably have PPS. raising son's dog, Dante. Husky/hound. As HG said, looks like your set up is pretty good - they have much improved conditions than they have had! Time will tell if it's just them getting used to their tank or if it's something more serious. Substrate needs to be moist enough to hold it's shape but not so wet that water pools. I agree that a bit warmer temps might make them more active. Check out the 'food' section for nutrition tips and the food pyramid. I am not familiar with that brand of dechlorinator - someone else will have to chime in. Instant Ocean is good for the salt water. Pools need to be deep enough that they can submerge, but also have a way for them to climb out. All that is needed is 'spot' cleaning poop and bits of food, no need to remove/ replace substrate. Another vote for wait and cross your fingers. Sometimes they have the ability to bounce back, and sometimes they were already hanging by a thread and moving them stresses them out so much they fade faster. I really think you've got everything perfect to give them the best possible chance. Just try and keep them as stress-free as possible for now, until you have a better idea which direction they are headed. Hi! I'm pretty new on this forum and what you're doing is really good, but I've had problems heating my ten gallon in the past and I have a couple suggestions. I had problems with the Zoomed heaters, I wasn't able to warm the tank past 77, so I got both the thirty-forty gallon and the ten-twenty heaters and the heat hasn't been an issue since. There have been warnings that insulating the Zoomed heaters makes a fire hazard, but I cover mine with no problems. If that doesn't help, covering the top of the tank with a towel might bring the heat up a tad. I hope that your crabs feel better! Two PPs: Jarvis and Friday(currently my picture) Who have been with me now for eight months! Zoomed heaters should not be insulated over top. A fire hazard isn't a problem until it is a very big problem, and too late to reverse. I put a towel over just the top of the tank, not anywhere near the uth. I'm not playing any games with insulating near/around/on top of the zoomed uth. I've got another one coming that I'm going to add to the side. Just adding the towel warmed it up a few degrees. I think once I add the other uth it will be perfect. Good news: Lyra (the one who was not moving at all) moved all the way to the other side of the tank today. I was so happy to see her up and about. Stardust is still hunkered down in the coco-hut but I feel at least a little better to see some movement and life. I'm just going to keep maintaining the tank and giving them healthy food and keep at it. So far so good I suppose. Any changes, I'll be sure to share. Thanks!